Bravo à tous nos représentants et aux participants. 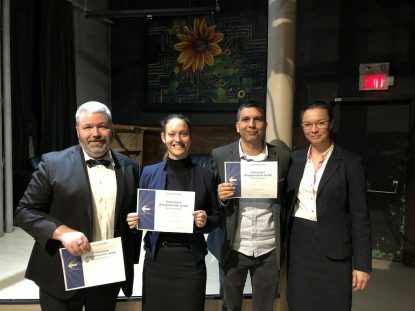 Les concours de discours ne sont qu’une des nombreuses manières que vous offre Toastmaster pour accroître vos capacités d’orateur et de leader. Pour en savoir plus, visitez nous lors de notre prochaine rencontre. You are invited to a fun and exciting evening at the Area 62 International Speech and Evaluation Contests. 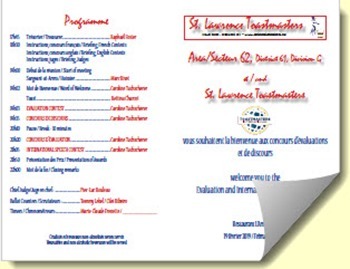 St. Lawrence Toastmasters Club is organizing this wonderful evening and we hope to see all of you. NOTE: The cost is $10. Vegetables & dip will be available before the contest, and the entrance fee also includes one free non-alcoholic drink. We recommend that everyone arrives early, (i.e. by 6:30 PM or earlier). 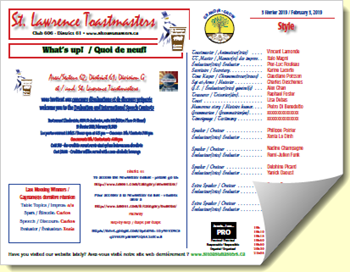 You may also download the Toastmasters Area 62 Contests Agenda. 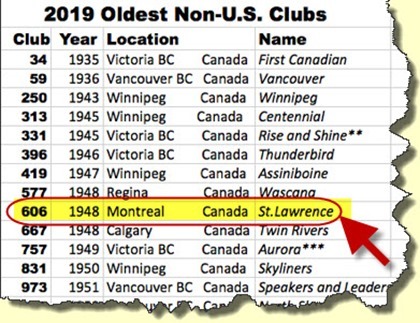 A big thanks to Bob Palmer for recently informing us that the St-Lawrence Toastmasters Club in Montreal is the 9th oldest club in the world outside of the United States. 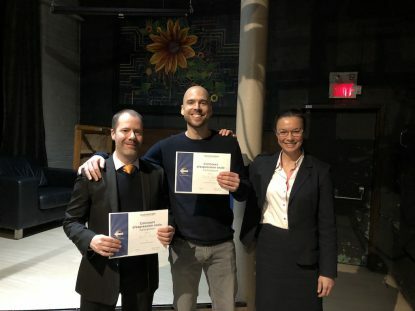 "I weeded out all the early club numbers that had been either retired by Toastmasters International or chartered elsewhere in other years and came up with a list of clubs which are STILL ACTIVE in the places they were chartered." Bob had recently also sent us some other interesting information about our club history, which we posted when our club celebrated its 70th birthday. Interested in visiting the most experienced Toastmasters club in Eastern Canada? Come attend one of our meetings! Here is the agenda for the meeting of February 12, 2019. Aimeriez-vous vous sentir plus à l’aise lorsque vous devez parler en public? Cherchez-vous comment communiquer plus efficacement? Voulez-vous devenir un leader plus compétent? 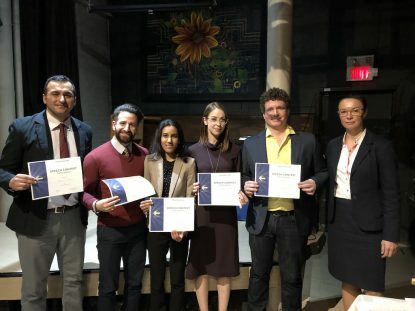 Venez voir comment Toastmasters peut vous aider à atteindre chacun de ces objectifs. 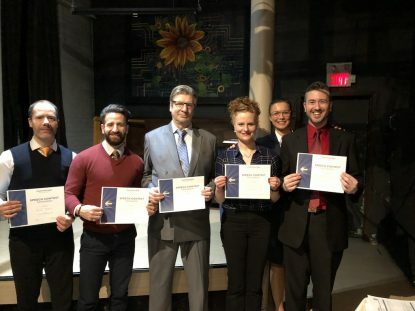 Visitez le club Saint-Lawrence Toastmasters à Montréal. Voici le programme pour la réunion du 5 février 2019.